Inspiration comes and goes for me. There are moments where I have more ideas than I could possibly make in one session and sometimes I have no Ideas at all. Sometimes all those ideas come to me when I’m trying to sleep. Overall, my inspiration is not predictable so when I have ideas I like to capture them and if I see something that inspires me I need to save it somehow. I like to have my idea’s and inspiration organised and in one place so I can always find something. This is not just for artists. Inspiration can be for all things like how you want your blog organised or what topics you want to discuss. Or maybe you have new promotion ideas. I have separate categories for this such as blog post ideas, drawing ideas and business ideas. These are my ways to save ideas and inspiration both online and in the real world. I keep a notebook with almost all the time. Most importantly I lay it next too my bed when I want to sleep. I tend to think a lot when I lay in bed so keeping my notebook close comes in handy. When I come up with topics or sayings I can write them down immediately. This way I always have a list of topics and ideas. I keep for example a list of drawing ideas and blogpost ideas but also improvement ideas. I also like to put inspirational things in this notebook and make it look pretty so I enjoy looking trough it. It makes finding inspiration for new projects very easy. Sometimes I leave the house with only my mobile phone and most of use to have smartphones. When I end up waiting somewhere I always get ideas (because I have time to think) so I have a few simple ways to keep those ideas on my phone. I take a photo if it is something visual like a beautiful tree or a weird building. For other ideas, I simply use my notes or Evernote which is a more fancy note-taking programme that syncs to my computers. I like the last one because it means I keep my notes in one place. For example; I keep a list of blog post topics on Evernote and I cross the ones that I have done. I think it is very handy to have a different list and topics (or even entire notebooks) for separate categories. I like the last one because it means I keep my notes in one place. For example; I keep a list of blog post topics on Evernote and I cross the ones that I have done. I think it is very handy to have a different list and topics (or even entire notebooks) for separate categories. My main sketchbook where I sketch out ideas and make designs and practise a lot. My experimental dummy where I use different materials and glue in pictures and ideas (this one is a little messy I admit). My travel sketch book. It’s a very small booklet that I take with me a lot. It has mostly very quick sketches that don’t look that great but which could be great sources for later! Another thing that I did was create a secret inspiration board on pintrest. Since it is a secret board I don’t have to stick to a theme on that one and I can just pin what I want. So if I see a beautiful place or dress or construction I can just pin it on that one for future reference. I like this method because it gives me a growing library of inspiration. For my blog I have a separate Inspiration board were i can keep interesting idea’s and quotes and such. In my room I have chosen one wall to be my inspiration wall. I use this one slightly the same as my pintrest board but not entirely. The most important things on this wall are the messages of friends and family that I have put there that inspire me. I also have photo’s and the cards that we used on trips. I also have some old artworks of mine that I like (or used to like). I try to add something new to this regularly so I keep having thing to look at. This wall I amazing for when I sit on my desktop and need some inspiration or encouragement. Inspiration is for most of us something that comes and goes. It would be lovely to be inspired all the time. By keeping al of these different ways to record ideas and inspiration I have always something handy. I think my favourites are the sketchbooks and notebooks. Mostly because I really love buying new ones, but also because I think nothing looks better than a good filled note or sketchbook! I think that everyone has his own ways for keeping their ideas save. Making these archives however means I never run out! I hope this was useful for someone. 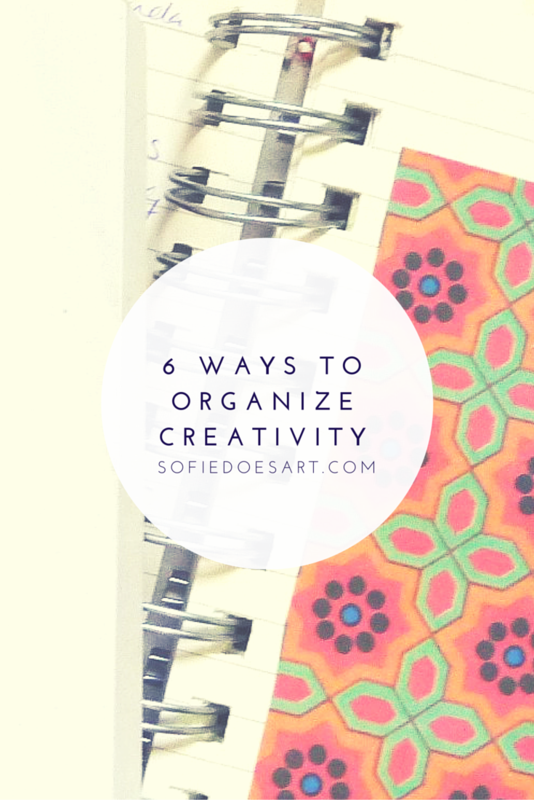 If you have any other ways to organise or capture inspiration do let me know in the comments below! I would love to hear from you!